The Apollo Theater in Siegen was the newest setting we performed in on this European tour - the oldest being the Oratoire du Louvre in Paris. 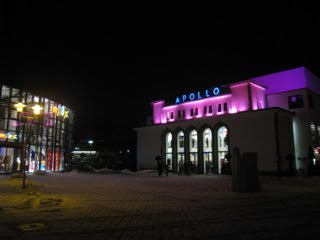 The Apollo was once the Apollo cinema, which was refurbished and reopened in 2007 as a concert hall. Our performance was sold out a while ago to the most vociferous audience we've had on this tour. You should have heard the whistling, hollering and stamping which went on throughout! A fantastic way to end the tour - we think we rose to the occasion, and were happy to respond in kind to all that energy coming at us with three encores. The Apollo has a very contemporary and relevant feel to it. It is part of a shopping mall - which probably grew up around the old movie theater. You can see into the building from the outside which makes it look very inviting. Before the concert previews of coming attractions are projected on a screen. Good idea!